However, this post is not about which operating system is or isn’t better – this post is about getting a chance to read a BSOD that happens on your system so you can do some troubleshooting. You see by default Windows 7 is set to re-boot your computer following a BSOD and unless your savvy at digging through the dump files it leaves your going to possibly miss a key indicator in why your system BSOD’d. 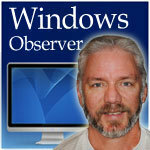 Windows Observer microsoft windows, Windows Observer. permalink.